These Chocolate Chip Cheesecake Brownies are soft, incredibly moist and rich – so perfect and decadent – you will love them! Please don’t mind me while I do a super-happy dance. Care to join me? 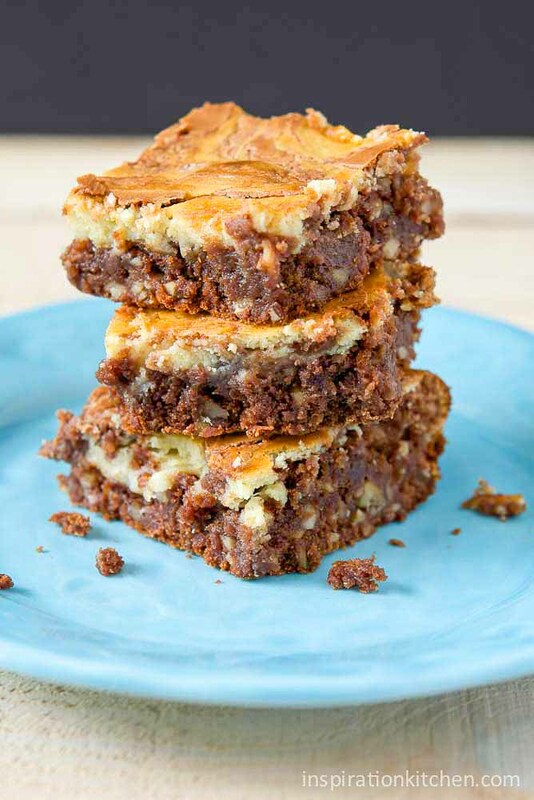 Remember my staycation brain moment when I was going to bring you a FABulous cheesecake brownie recipe, then completely lost and forgot where I put it? I was practically in tears because that recipe was so mouthwateringly good. Remember what I told you about them? Here’s a little re-cap from my previous post. Well, I finally found it!!!!! And now, I get to share it with all of you. I could just squeeeee I am so happy. Because I really, really, really did not want to lose this one. Preheat oven to 350 degrees F. Grease a 9 inch square baking pan. Combine cream cheese with ¼ cup sugar and 1 egg in a mixing bowl and beat until smooth. Stir 1 cup chocolate chips into the cream cheese mixture. Set aside. Fill a saucepan with water and bring to a boil. Turn the heat off, and set a heatproof mixing bowl over the water. In the mixing bowl, combine butter with the remaining cup of chocolate chips; stir until just melted and blended together. Stir in the remaining ½ cup sugar and 2 eggs, then sift together flour, baking powder, and salt; stir into chocolate until evenly blended. Pour half of the batter into the prepared baking pan. Layer with the cream cheese mixture over the chocolate layer, and then top with remaining chocolate mixture (this doesn't need to completely cover the cream cheese layer). Using a knife, swirl the top chocolate layer into the cream cheese to make a marble pattern. Bake in preheated oven at 350 degrees F for 25 to 30 minutes, or until top is crinkled and edges pull away from sides of the pan. Cool thoroughly before cutting into serving size pieces. Recipe adapted from Chunky Cheesecake Brownies @ All Recipes. Haha! It DID feel like Christmas – they were so good, and I was heartbroken I’d lost the recipe. Thanks Christin! Oh man these look delicious!! What a tasty combo! Thanks Cailee! Everyone who tried them loved them! So glad you found the recipe because these brownies sound perfect. And I have all the ingredients to make them on hand. Awesome! If you’re making them, I’m coming over!!! Yummy! Don’t mind if I have two..
Two great things in one recipe, right? I’m so so happy you found the recipe, because girl, these look scrumptious!!!!! You know how I love cheesecake, and if there’s chocolate involved too, you bet I’m in 😉 Pinning! You’re hard to stay ahead of in the cheesecake world Consuelo – I have to keep out-thinking you! Hahaha! I hate losing things, especially recipes. So glad you found it and shared with us. I can see why they’re a winner…they look a-maze-ing! Thanks Tina! They were chocolately and creamy delicious for sure! Yay! So glad you found this recipe! I am doing the happy dance with you. These brownies look seriously yummy! Thanks! Dances are always more fun with a few of us, aren’t they?! Happy dance all around! These brownies are happening in my kitchen. So glad to have you all dancing with me! Love it! I’m dancin’ now that I know these brownies are happenin’ in your kitchen! Oh yay! I can see why you were heartbroken when you thought this one was gone! LOOKS SO GOOD! Thank you for sharing. Thanks Monet! I hope you love them as much as we did! Oh my gosh these brownies look absolutely delicious! 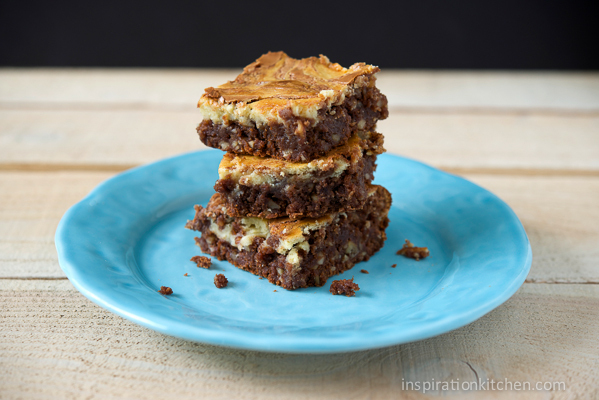 I’ve made brownie and cheesecake swirl slice before but never layered like this! The recipe looks so easy and delicious. Thanks for sharing! Yea! I’m so glad you like them Lillian! All of my fav ingredients into one decadent brownie!! Hahaha! I agree with you! These look so good! I wish I could reach through the screen and grab one. Thanks for sharing. Thanks Melissa! We love these brownies – cheesecake and chocolate – oh yum! Haha! I LOVE these brownies Kristi!!! Thank you Lauren! They are so addictive, it’s almost sinful. 🙂 I can hear the song now: “Bad girls, bad girls, whatcha’ gonna do?” I’m telling you – Im eating brownies! Haha! OMGosh, you are so right! Two desserts and one – that describes it exactly right! Omgggggg! These look so amazing!